One of the favorite spaces we have at home could be the ones that’s been carved out what was once an empty attic or maybe a basement – really depending on your call. These spaces make you feel cozy, hidden and pretty much special. The sloped ceilings enhance the experience for the space, won’t you agree? The truth is, whether we deny it or not, that sloped ceiling in your homes are here to stay. We’re sure that almost every house has that one quirky, awkward room with the slanted ceiling. Comparing the attic to basement like what we mentioned above makes us want to really regret it, but believe it or not, rooms with slanted or sloping ceilings can really be a charmer. But, as charming as they are, they also can leave you scratching your head as you try to come up with a design that makes the most of the space. 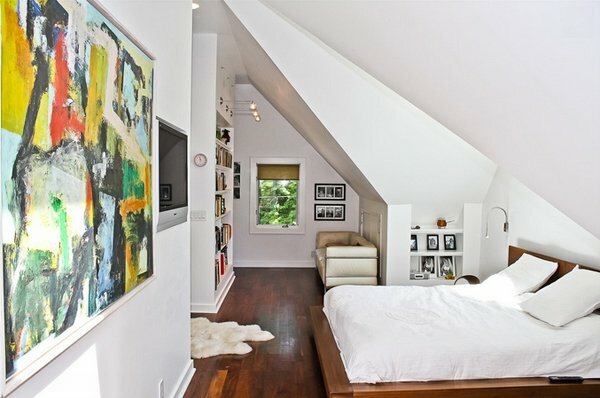 So, for today, we will be showing you 15 Charismatic Sloped Ceiling Bedrooms, here we go! The ceiling of this bedroom makes the room seem more spacious and the choice of color makes this room look classy and contemporary. 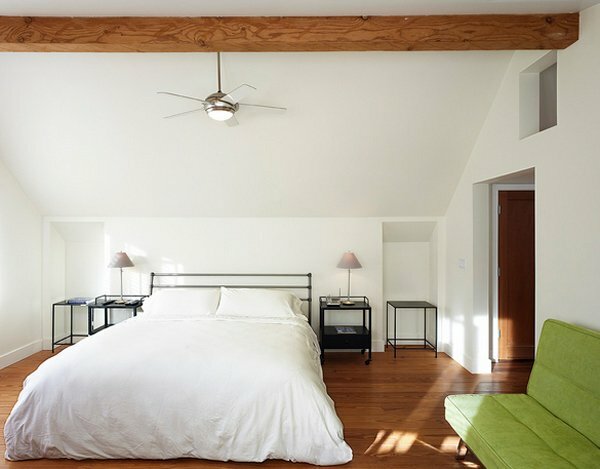 We really like the contrast of white ceiling with mono-pitched exposed beams of this San Francisco bedroom. 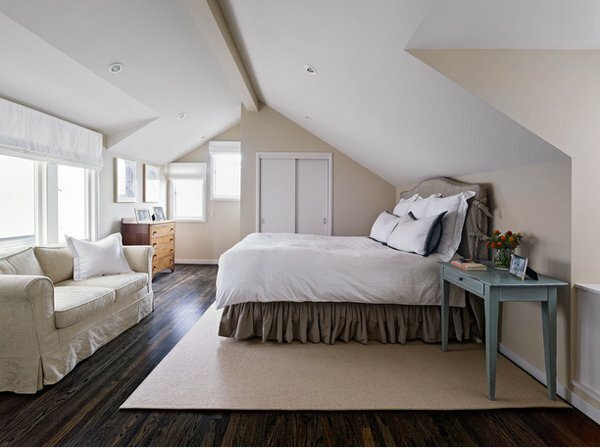 The bed maybe the highlight of this Chicago bedroom, but with the gorgeous exposed/sloped ceiling gives this space a homey feel – comfy and stuffed but surely stunning. Area rugs are often used to tie a space together. I love how this rug is the room’s focal point. What I learned: If you find something you love, like this bright rug, embrace it. Build a room around it. 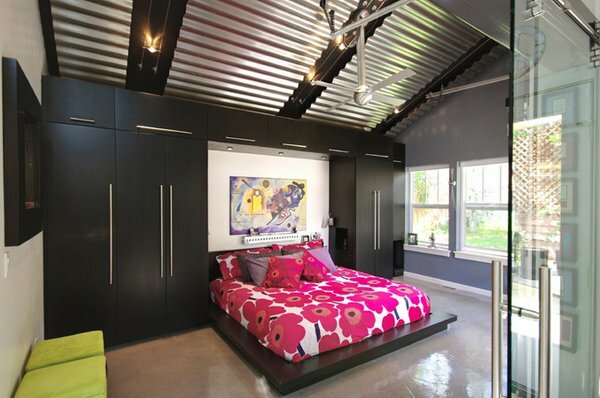 This contemporary bedroom boasts a corrugated steel ceiling panels, stainless steel propeller fans and a glass garage door opening to the backyard. If your floors have gotten a lot of wear and tear, why not paint them for a new look? White is airy and fresh, while a darker hue, like the blue used here, and looks cool and inviting in summer. This Miami contemporary bedroom is a bit Asian because of the materials used for the headboard and the fabric used for the pillow cases. We see a lot of these materials in the Asian section. 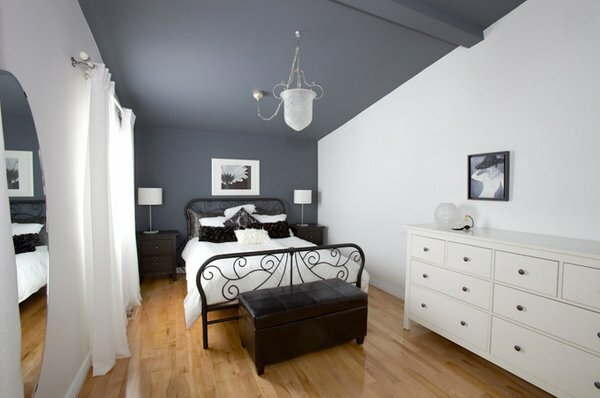 If you opt for a darker version of the color, try painting a swath of wall and ceiling rather than the entire space. You’ll get the drama without making the space look too dark and heavy. French doors lead out to a private master deck. Skylights bathe the room in natural light. At the far end is the closet, with windows that face the front of the house. Great wall art for this white bedroom located in New York. The designers did a good job in making use of this minimal space and making it look this simple, but really comfortable. 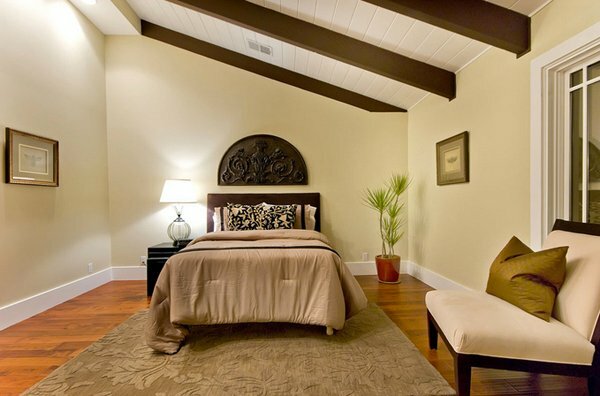 Do you like the ceiling treatment used in this bedroom? Because we do. White bedrooms sure look great for mixing and matching. Simple complementary colors were used for this bedroom in San Francisco and when you look at the colors, they seem rather clean and appealing. Won’t you agree? 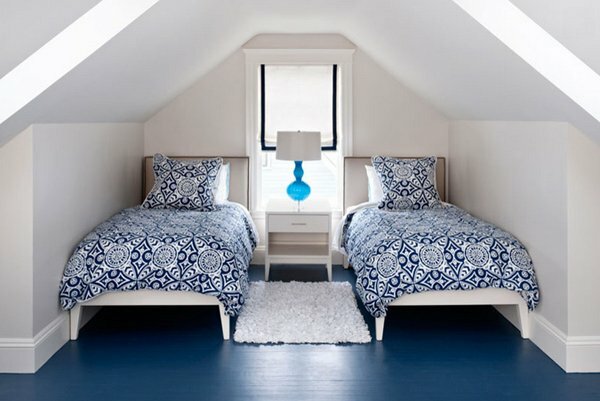 One of the most valuable qualities of an attic space is quiet. If you’re dying for a little peace and a good night’s sleep in an active household, move the master bedroom to the top floor. You’ll wake up every morning quite happy you made the move. 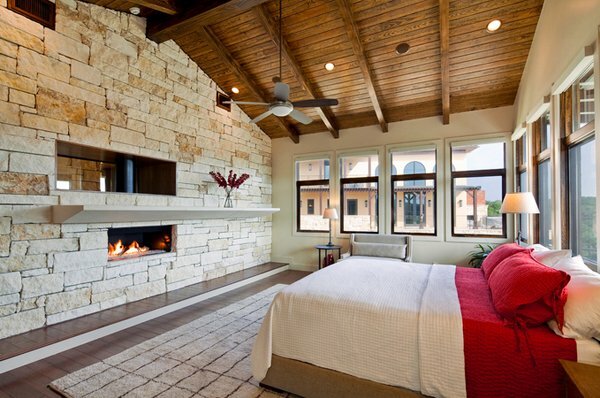 This Austin bedroom looks like a man cave but sure would really for anyone into wood and stone construction. The textures for this space is totally stunning and really creative. Four things – Natural wood beam. Slope ceiling. Wood floors. White walls. Don’t you just love it. 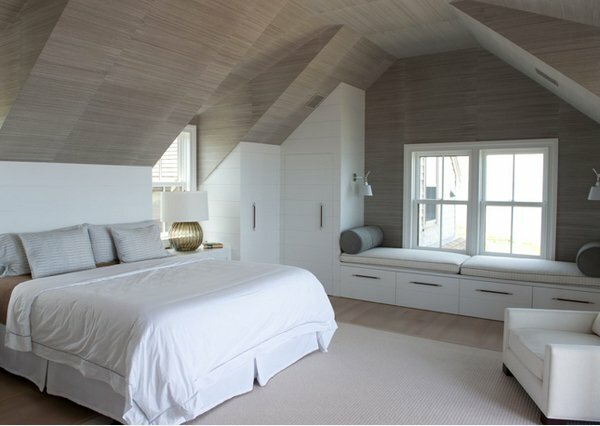 Although there are a lot of things we can do with our attics – or the so-called rooms with slanted or sloped ceilings – like a playroom, a kitchen, a living area or even a closet (when it is close to your bedroom, really) we hope that the 15 Charismatic Sloped Ceiling Bedrooms made you reconsider how you would want to make use of your room. We actually think that the list above was fabulous and really fun! Check out the 18 Living Room Designs with Vaulted Ceiling to see more inspiration!